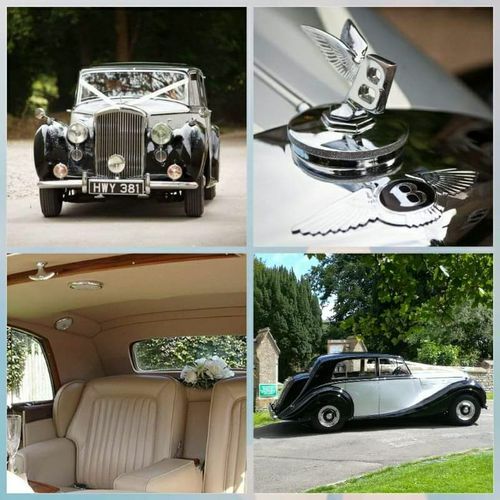 If you are one of our many couples who have both your wedding ceremony and reception at a single-venue, but still wish to travel there in style, on selected Fridays and Sundays throughout 2019, we are pleased to offer a very special price on our stunning 1947 Bentley MkVI . Everyone loves to see a Bride en-route to her wedding in a beautiful classic car. We never forget what a very special moment she and the one chosen to walk her down the aisle, are sharing at that time. 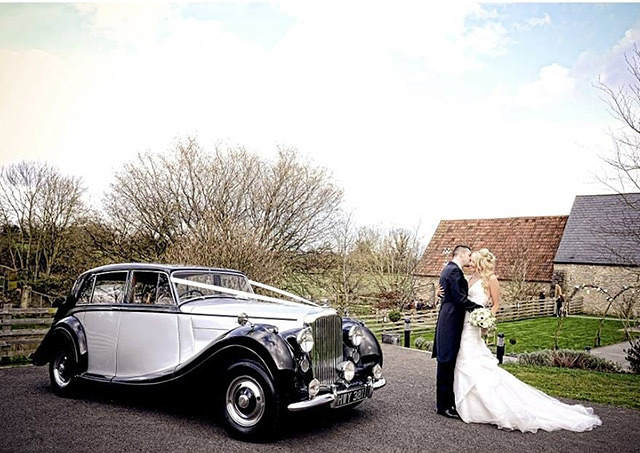 With all our wedding bookings, your fully-unformed chauffeur will arrive with you at your departure location at least half an hour before your journey is due to start, with our immaculately-presented Bentley, that unlike many modern cars, offers plenty of rear space so that you and your wedding dress arrive uncreased and unruffled. The rear doors are also hinged to the rear, making entry and exit, just that little more elegant! If you are leaving from close to the venue, we shall be pleased to include an additional run for your Bridesmaids and Attendants. Likewise, if you are nearby, we can take the long-way-round, so that you can enjoy the experience a little longer! With our compliments, why not ask your chauffeur to open a bottle of something from the ice bucket to toast the day ahead? Once at the venue we offer the option of the car remaining for photos and also for the newlyweds to grab a few precious moments together during a drive following the ceremony. Or give us a call on 01761 451142 - We would love to hear from you! On selected dates (excluding Spring/Summer Saturdays) throughout 2019, we are pleased to offer a reduced price for Orchardleigh couples marrying at either St Mary's Church or All Saint's Church in Lullington, before returning to Orchardleigh House or The Walled Garden for your reception. Our pricing includes upto three journeys to the church for the Bridal party and we shall be pleased to take an extended route to your reception location, allowing your guests to travel to greet you upon arrival. The beautiful grounds of the estate offering a perfect opportunity for a few photos en-route. 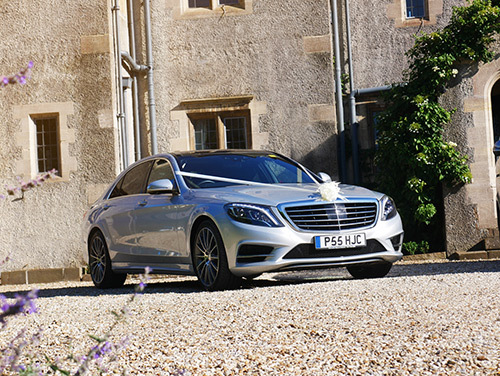 The sleek Mercedes S-Class Limousine is regarded as one of the finest cars currently available and makes a stylish statement for the newlywed couple's evening departure from the reception venue. We offer the long-wheelbase version, providing an additional four inches of rear legroom for maximum passenger comfort and plenty of space for the wedding dress. We understand that it can be hard to leave the party behind, and allow a little flexibility in departure times for final goodbyes! If the evening's dancing is already taking it's toll, let the massage seats soothe-away any aches and pains and if you want to check your Honeymoon weather, or just to see what photos of the day have already been posted on Social Media, 4G Wifi is provided. Please mention "Evening Offer" when requesting further details or a quotation*. Even if you have left it a little late, please do contact us. If we cannot help, with over ten years experience, we may well be able to point you in direction of somebody good who can!